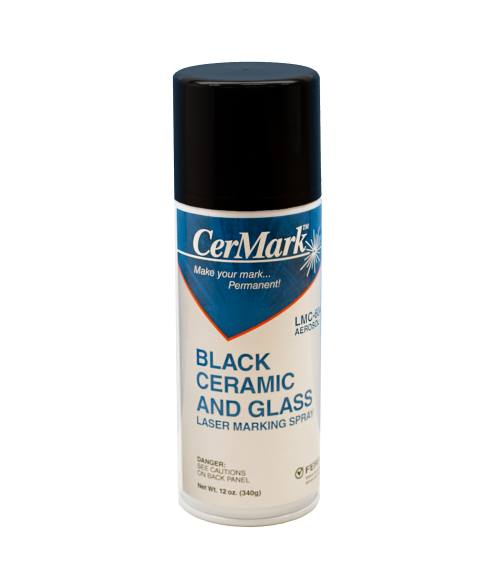 Create rich, black engraving on any ceramic or on glass, available in an easy to use spray can! CerMark Tile & Glass solution creates durable black engraving using a C02 or Fiber laser. Spray a light coating on to any ceramic or glass and allow to dry. Then laser engrave to fuse the coating. Wash off with water to reveal the black engraving. Photos, text and clipart come to life on ceramic or glass substrates. The engraving is fused to the surface. It is as durable as the substrate. Stemware, bottles, tiles from your local home center, coffee mugs are just a few of the products that can be decorated with the CerMark Tile & Glass Solution Spray Can. Applied like a regular can of spray paint, one can will cover approximately 1100+ square inches.